Love is patient, love is kind, love fills your tummy with decadent treats made with love. Still looking for a special place that serves special treats that you can enjoy with your special someone? 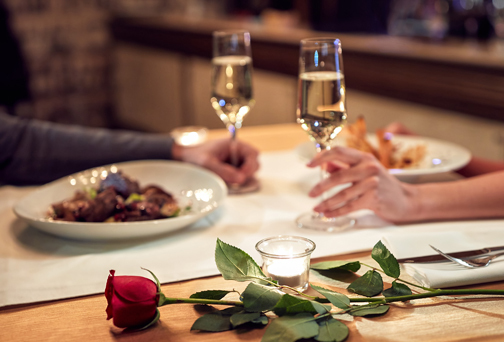 Here’s a list of premier restaurants around the metro that know how to make Valentine’s Day dinner date special. Nobu presents a five-course Valentine’s Weekend Omakase with Sake Cocktail Pairing from Feb. 14 to 16 at P10,000 nett for two persons or P5,000 nett for one (optional). 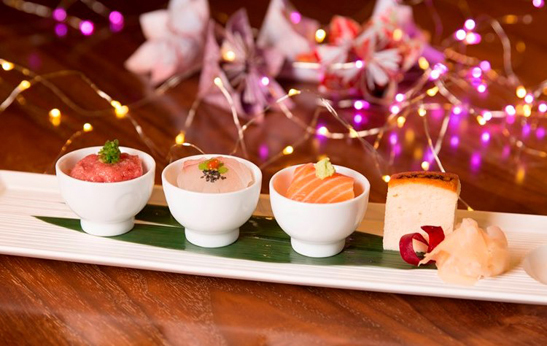 The Valentine’s Nobu Omakase dinner starts with Zensai, a chef’s selection of appetizers paired with Sake Rosé and Kumomo, followed by Nobu Sashimi Platter and seasonal selection of Nobu sushi which includes toro, Nobu Tamagoyaki, lapu-lapu, and salmon. Brick Oven Roasted Slipper Lobster Tail with Lobster Miso Cappucino and Sweet Corn Kakiage, and Sous Vide Australian Tenderloin with Nobu Bonito and Uni Egg Sauce, Crab, and Umami Vegetables precede dessert consisting of Strawberry Adzuki Bean Entremet with Kinako Cookie and homemade strawberry ice cream. Nobu Manila is at City of Dreams Manila, Parañaque City. Treat your date to a Michelin-star dinner. From Feb. 13 to 15, the Tasting Room serves a five-course Valentine’s dinner menu priced at P6,600++ per person. The meal begins with lentils hummus with hazelnut oil, gray shrimp, tiger prawns and served with Socca; and crackers served with eggplant, apple, and mint; followed by Grilled Foie Gras Terrine with artichoke and Port wine; cod served with pineapple, coriander and sesame seed; Smoked Grim Beef Tenderloin with coffee, salsify and hazelnut; and concluded with an indulgent dessert of Chocolate Ginger Tart with Exotic Fruits and Pomegranate. The set menu comes with an option for wine pairing at P3,100++. For added enchantment, the dinner comes with a complimentary welcome glass of Henriot Brut Champagne, a door gift of Mexican hot chocolate cube and lemon cake, and a long-stemmed red rose for the lady. The Tasting Room is on the ground floor of NÜWA at City of Dreams Manila. Craving Chinese? Crystal Dragon, known for its award-winning Cantonese and regional Chinese specialties, is featuring a Romantic Dinner Set Menu from Feb. 13 to 15. The five-course Valentine set menu, priced at P3,880++ per person, consists of a romantic heart-shaped Stuffed Breaded Prawns Cake on Mixed Salad with Swan Dumpling filled with Black Pepper Duck Meat; Braised Sea Treasures and Scallop Dumpling served with Black Truffle in Lobster Bisque; Braised Pork Ribs with Red Wine Vinegar and Wolfberry Reduction; Wok-fried Egg Noodles with Seafood, Sliced Abalone, and Vegetable Sauce; and Earl Grey Vanuari Milk Chocolate Crème Cake with Rose Water Strawberry Gel. Crystal Dragon is at NÜWA Tower 1, City of Dreams Manila. Your love deserves the best, and Cravings understands that that’s why from Feb. 14 to 16 it is serving a special four-course dinner featuring the best of mains, steak, and salmon. Cravings’ special four-course menu consisting of Truffle Mushroom Soup, Mixed Greens Salad, Fillet of Atlantic Salmon, and U.S. Roasted Prime Rib. Start with the savory flavors of Truffle Mushroom Soup and fresh Mixed Greens Salad with Dried Fruits and Candied Walnuts. After that, couples are invited to indulge in a fine, tender slab of U.S. Roasted Prime Rib, served with Yorkshire Pudding; and Fillet of Atlantic Salmon served with Lemon, Caper Sauce with Grilled Tiger Prawns. Completing the dining experience is a delightful slice of Special Edition Lava Cake. 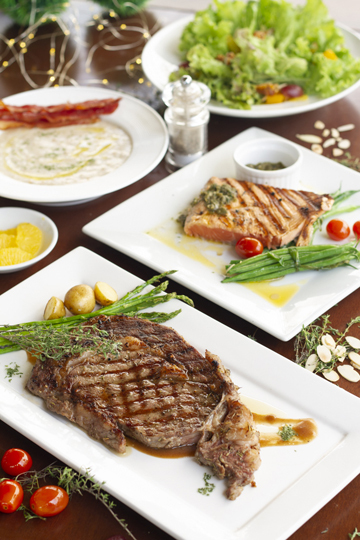 This dinner for couples is priced at P2,400. Cravings is at 287 Katipunan Avenue, Loyola Heights, Quezon City. 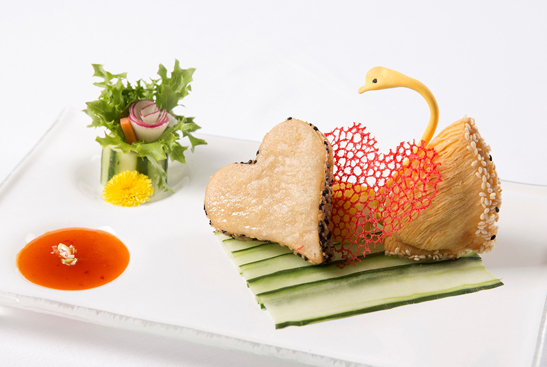 Indulge in an exquisite tea-infused Valentine’s Day menu priced at P2,650 for two. The intimate evening for two begins with an enticing beef pastrami accompanied by marinated tomatoes and feta cheese infused with Lover’s Tea. The romantic gastronomic journey continues with the luscious duck confit with Billet Doux Tea-infused Mexican mole sauce served with sautéed mushrooms and baby potatoes, and a delectable beef with Red Chai-infused red wine sauce accompanied by a spinach and purple yam croquette. A beautiful accompaniment to this main course is the aromatic Mon Amour Tea. For an unforgettable celebration, declare your love with choux pastries delicately centered with Geisha Blossom Tea-infused raspberry cream on a shortcrust pastry. 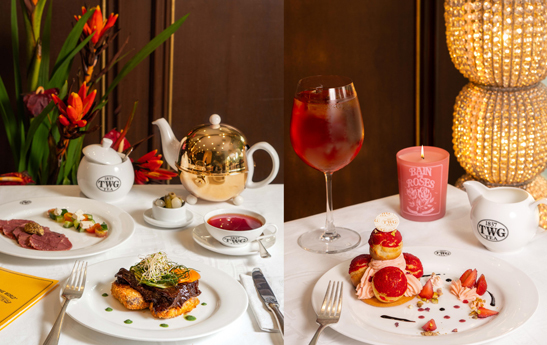 TWG Tea has branches at Shangri-La Plaza, Greenbelt 5, Newport Mall, Power Plant Mall, Central Square, and Alabang Town Center. The in-house restaurants of five-star hotel Diamond Hotel let lovers express their love with decadent dishes from Feb. 13 to 15. Yurakuen’s assorted sashimi (left) and Corniche’s Valentine’s Day buffet with a side of romantic music. For a truly filling date, Corniche serves Valentine buffet for P3,380 nett per person. Yurakuen, on the other hand, offers a lunch and dinner set menu with a glass of Piper Heidsick for P2,880 nett per person. Lobby Lounge serves a four-course set menu with a glass of Cava and a slice of complimentary cake for P3,300 nett. While Poolside offers a romantic date under a beautiful night sky complemented by a five-course dinner for P2,800 nett per person. All ladies dining on Valentine’s Day will receive a special memento. Diamond Hotel is located at Roxas Boulevard cor. Dr. J. Quintos Street, Manila. Cafe 1228 serves a romantic Valentine’s Day buffet spread. 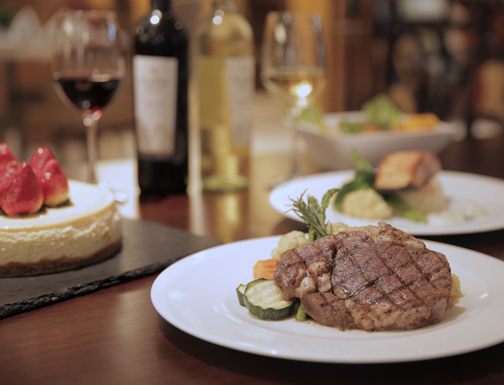 Say “I love you” with a candlelit dinner at Café 1228 in New World Hotel Makati. Couples can indulge in buffet highlights such as chateaubriand steak, seafood specialties, and chocolate-dipped strawberries for P2,999 per person. Dining ladies will receive a special Valentine’s Day present. Café 1228 is at New World Makati. 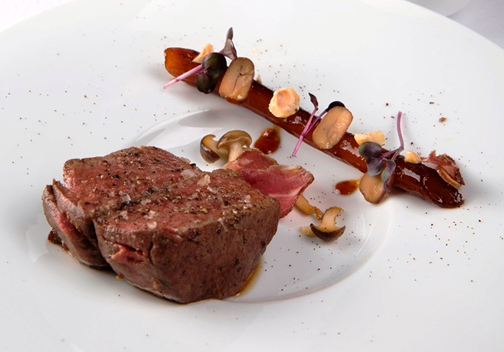 Make February 14 a special day with hefty servings of delectable Italian-inspired cuisine at Richmonde Café. The buffet spread, dubbed Viva Amore! Valentine’s Day Dinner, features tasty starters of seafood and cold cuts at the antipasto tavolo (appetizer table), the assorted insalata (salads), pane (bread), and zuppa (soup) are sure to whet the appetite for the plated entrée which is a choice of either grilled rib eye with mushroom sauce or pan-seared salmon with lemon cream sauce. Divine dolci della pasticceria (cakes from the bakery) overflow at the dessert counter to give a perfect ending to a sensuous feast. The buffet dinner is priced at P1,498 nett per person. Richmonde Café is at Richmonde Hotel Ortigas, Pasig City.